What do Roma and homosexuals have in common? They are confronted with structural discrimination. So seminars in Berlin and Bratislava took place to plan the fight against this obstacle through concrete action. Olympia-Stadium. Charlottenburg-Wilmersdorf, district of Berlin. Here, Italy won the Mens World Cup of 2006, on June 26th the Womens World Cup 2011 was introduced (started). The Olympia-Stadium is also the home of the traditional football club Hertha BSC. 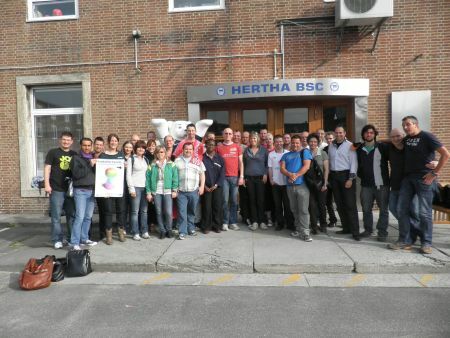 And it was Hertha, whose facilities offered the holding of the conference: “Football against Homophobia”. The conference took place from May 21th to 23th and was organised by the European Gay and Lesbian Sports Federation (EGLSF) as part of the project “Football for Equality”. It was a follow-up meeting of pan-European gay and lesbian football fan clubs in February 2009, that took place in Barcelona. Apart from activists of gay and lesbian football clubs and supporter groups, other football institutions and fan networks joined the meeting too. In addition, 30 participants were attending. The participants exchanged their knowledge and experience in connection to the issue of homophobia. On this basis, they discussed the possibilities of cooperation with national football associations and clubs in regard to plan campaigns against homophobia in football. They talked about the various forms of activities like football tournaments, discussion events, lobbying with clubs, football and political bodies or the production of campaigning material like flyers or video clips. In the next phase, they passed on to the planning of concrete activities like an European action day against homophobia in football, a pan-European Charter and the survey of existing research on the topic of homosexuality and homophobia in sports and especially in football. Afterwards seperate groups were formed to implement these proposals. The prominent location of Hertha was visited by a prominent guest: A local Berlin politician supported the last session on Sunday. Officials from the UEFA and the German Football Association (DFB) were prevented by schedule difficulties, other associations didn’t respond. This shows the still existing ignorance among football institutions. Here, the conference concluded that more lobbying and campaigning is necessary. It’s also necessary to build broader and more professional structures to really face homophobia. Honved Budapest, Eintracht Frankfurt and Hapoel Tel Aviv – prominent adresses in football, Istvan Pisonts varied football career brought him to these well known football clubs. He is now the youth coach at the Hungarian Football Federation (MLSZ), but he is also a role-model for young Roma, who do not admit their identification. So he visited the Closing Expert Meeting in Bratislava, which raised an issue of the inclusion of Roma through football. The meeting took place from April 8th to 10th 2011. In the course of that and as part of the project “Football for Equality”, the FARE partner Ludia Proti Razismu (LPR) organised a seminar. Among the 35 participants were Antiracist NGO’s, Roma groups, fan’ initiatives, football bodies and LGBT groups. The seminar was located at the Ústav Vzdalávania a Sluzieb, the centre for education and studies, in the Kramáre district of Bratislava. While the first workshop focused on the inclusion of Roma, the second one was dedicated to the fight against homophobia. Before that, the conference was introduced to a sum up of the situation in Central and Eastern Europa with regard to both issues. Here, Irena Biháriová of Ludia Proti Razismu outlined the role of football for integration: “Where people are not judged based on their origin or the colour of their skin but by their performance and team play.” In both workshops the participants from various countries shared their experiences, expertise and exchanged good practice ideas to combat discrimination. The participants concluded, that both issues are facing similar structural problems, in many cases Roma and homosexuals are regarded as invisible minorities. So the attendants presented potential projects and activities, especially with regard to the Euro 2012 in Poland and Ukraine, but also to the upcoming FARE Action Week, that is also part of “Football for Equality”, which is supported by the European Commission (DG Justice) under the Fundamental Rights and Citizenship Programme. By the way, this project will be continued: On Sunday, during the last session of the meeting, “Football for Equality 2” was presented.